I recently received a marketing promo email from Canon and although they’re usually interesting, I found this particular one pretty appalling. See email below. As a photographer working in the construction sector, I’m particularly aware of the risks of capturing images in dangerous, difficult and highly elevated situations. However, in addition to the usual photography training a professional photographer undertakes, anyone working in construction has to have the necessary appropriate PPE (personal protective equipment) and own a Construction Skills card. The card indicates you’ve had training and passed a construction qualification, that teaches you to recognise risks and work safely around construction sites. Also, when ‘working at height’ there is more legislation and further qualifications that are needed to ensure that you’re capable of working safely whilst facing these additional dangers, how to conduct yourself at height and more importantly keeping others safe around you. Harnesses, tethers and fall arrest systems are the norm whilst working at height. 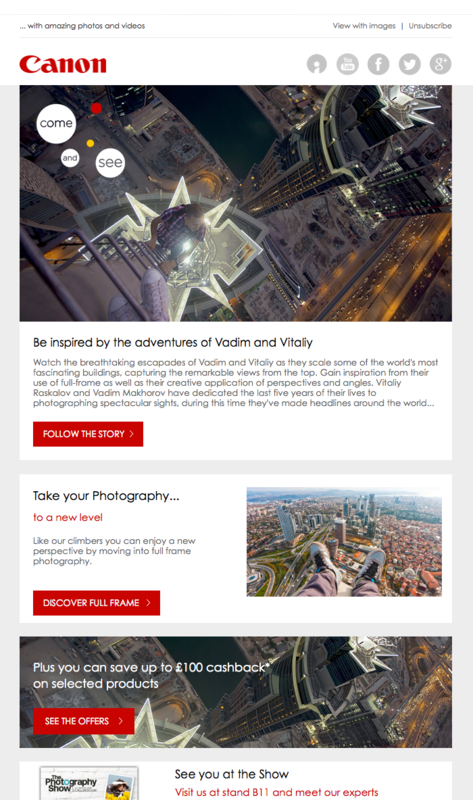 Disappointingly, this recent email campaign from Canon appears to endorse and encourage the highly illegal and extremely dangerous exploits of urban free climbing. For those not familiar with the term ‘it’s scaling high buildings and other structures risking your life to capture a picture of the view and of course you and your mate sitting precariously on the edge of the building looking down on certain death. Exciting, exhilarating – yes, hideously dangerous… definitely, responsible marketing – absolutely NOT. I was shocked to see them aligning themselves with this unlawful practice in order to sell more cameras. Has Canon so completely lost their focus on the professional market that they need to target amateur photographers with law breaking tendencies? I understand that they’re losing ground to the GoPro world of extreme sports and maybe this is a market that they wish to target. But GoPro aren’t using illegal activities to excite their demographic, they’re doing it with clever tech and powerful products that are affordable enough to flood the market. I think this latest campaign falls woefully short of their corporate responsibility and treads dangerously close to encouraging and advocating copy-cat enthusiasts to break the law and risk their lives for a picture. Canon, yes I use your products, but honestly…please do better. What’s next? Using captured HD video footage of muggings to sell cameras? What do you think? Is this a social smart move by Canon or a marketing blunder? I’d love to hear your thoughts, so please post below.